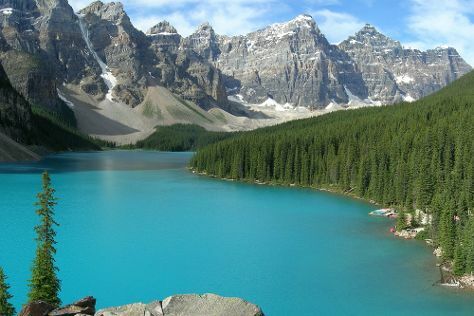 On the 3rd (Sat), explore the activities along Moraine Lake. Here are some ideas for day two: stop by Wilsons Mountain Sports, then stroll through Plain of Six Glaciers, and then explore the activities along Lake Louise. For reviews, maps, more things to do, and other tourist information, refer to the Lake Louise trip itinerary planner. New Delhi, India to Lake Louise is an approximately 26-hour flight. The time zone difference moving from India Standard Time to Mountain Standard Time is minus 12 hours. Expect colder temperatures when traveling from New Delhi in June; daily highs in Lake Louise reach 19°C and lows reach 3°C. Finish your sightseeing early on the 6th (Tue) so you can drive to Canmore. Start off your visit on the 6th (Tue): take in the exciting artwork at All In The Wild Gallery, then explore the wealth of natural beauty at Banff National Park, and then relax and float downstream with a rafting and tubing tour. Here are some ideas for day two: explore the stunning scenery at Johnston Canyon, then take in the natural beauty of Cave and Basin National Historic Site, and then pause for some serene contemplation at St. Paul's Presbyterian Church. For reviews, maps, other places to visit, and more tourist information, go to the Canmore trip itinerary planner. Drive from Lake Louise to Canmore in 1.5 hours. Alternatively, you can drive; or take a bus. In June, daily temperatures in Canmore can reach 20°C, while at night they dip to 5°C. Finish up your sightseeing early on the 8th (Thu) so you can travel to Vancouver. Kids will enjoy Granville Island and Vancouver Aquarium. The adventure continues: tour the pleasant surroundings at Stanley Park, trek along Seawall in Vancouver, enjoy the sand and surf at Kitsilano Beach, and browse the eclectic array of goods at Granville Island Public Market. To find maps, where to stay, more things to do, and other tourist information, go to the Vancouver trip planner. Traveling by combination of bus and flight from Canmore to Vancouver takes 5.5 hours. Alternatively, you can drive; or take a bus. The time zone difference when traveling from Canmore to Vancouver is minus 1 hour. Plan for a bit warmer nights when traveling from Canmore in June since evenings lows in Vancouver dip to 13°C. Finish your sightseeing early on the 11th (Sun) to allow enough time to travel to Montreal. Kick off your visit on the 11th (Sun): pause for some serene contemplation at Co-Cathedral of Saint-Antoine-De-Padoue. Keep things going the next day: contemplate in the serene atmosphere at Notre-Dame Basilica of Montreal, explore and take pictures at Biodome de Montreal, and then take your sightseeing to a higher altitude at Mont (Mount) Royal. To find photos, more things to do, where to stay, and other tourist information, you can read our Montreal trip generator. You can fly from Vancouver to Montreal in 7 hours. Alternatively, you can drive; or take a train. The time zone difference moving from Pacific Standard Time to Eastern Standard Time is 3 hours. Traveling from Vancouver in June, expect Montreal to be somewhat warmer, temps between 27°C and 17°C. Finish your sightseeing early on the 14th (Wed) to allow enough time to drive to Quebec City. 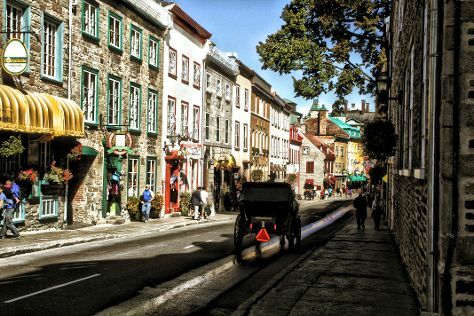 Kick off your visit on the 14th (Wed): take a stroll through Quartier Petit Champlain and then appreciate the extensive heritage of Old Quebec. Here are some ideas for day two: immerse yourself in nature at Montmorency Falls Park (Parc de la Chute-Montmorency), then get to know the fascinating history of Place Royale, and then contemplate the long history of Morrin Centre. For ratings, maps, traveler tips, and more tourist information, refer to the Quebec City trip generator. You can drive from Montreal to Quebec City in 3 hours. Alternatively, you can take a bus; or take a train. In June, daytime highs in Quebec City are 25°C, while nighttime lows are 15°C. Wrap up your sightseeing on the 16th (Fri) to allow time to travel to Toronto. Family-friendly places like CN Tower and Casa Loma will thrill your kids. Shop till you drop at Tilley Endurables and SOMA chocolatemaker. 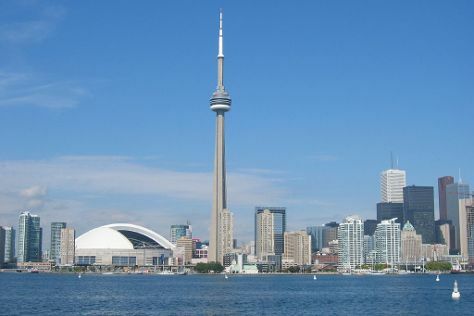 There's much more to do: admire nature's wide array of creatures at Toronto Zoo, appreciate the extensive heritage of The Distillery District, make a trip to Harbourfront Centre, and stroll through Ripley's Aquarium of Canada. To find photos, more things to do, where to stay, and other tourist information, go to the Toronto itinerary maker. Do a combination of bus and flight from Quebec City to Toronto in 4.5 hours. Alternatively, you can drive; or take a train. Expect a daytime high around 28°C in June, and nighttime lows around 18°C. Finish up your sightseeing early on the 20th (Tue) so you can go by car to Niagara Falls. Attractions like Niagara Parks Butterfly Conservatory and Marineland make great kid-friendly stops. The adventure continues: admire the sheer force of Niagara Falls, enjoy breathtaking views from Skylon Tower, get to know the fascinating history of White Water Walk, and look for all kinds of wild species at Bird Kingdom. To find photos, where to stay, more things to do, and other tourist information, read our Niagara Falls vacation builder. Traveling by car from Toronto to Niagara Falls takes 1.5 hours. Alternatively, you can take a bus. Expect a daytime high around 28°C in June, and nighttime lows around 16°C. Wrap up your sightseeing by early afternoon on the 23rd (Fri) to allow enough time to travel back home.